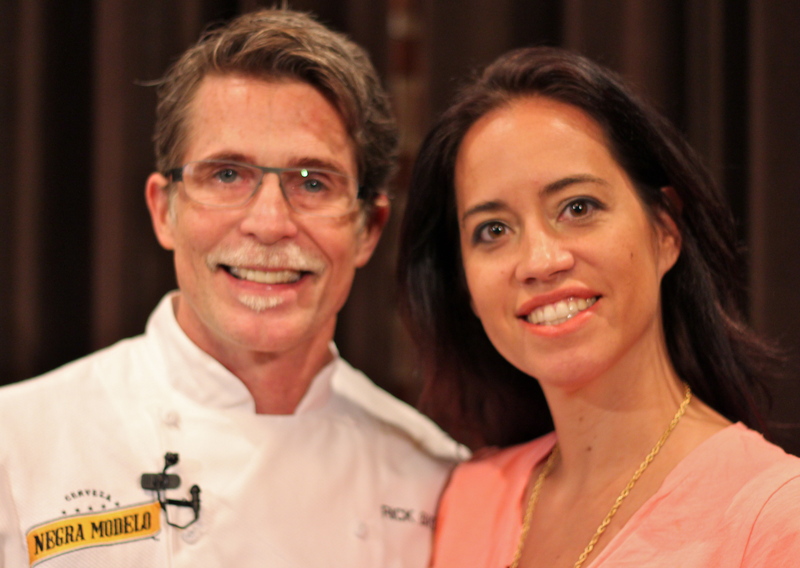 Almost ten years ago, I was introduced to Chef Rick Bayless in my living room. It was a Saturday afternoon, back in the days when my husband and I were childless and the weekends were low-key. We were struck by this show called Mexico: One Plate at a Time because it was more than just a cooking show, it was a travel show with a deeper look into the Mexican culture through its cuisine. “Good food, served well, is an emotional experience,” and after one show, we were fans of Chef Rick Bayless. Fast forward to last week, when I was given the opportunity to meet Chef Rick Bayless, see him prepare a Mexican dish and learn some tips through #FoodieChats and Negra Modelo. I have to say I was as giddy as my daughter when walking through the American Girl store. It was truly a dreamy day and an item on my bucket list that I can scratch off. First, the day started off with #NegraChefChallenge, where Seattle’s Chef Tom Douglas welcomed Chef Rick Bayless to his city to cook some Mexican food. I have to be honest, when I think of Mexican food, I do not think of Seattle, BUT my opinion has quickly changed. I never thought about taking some of the great local Seattle foods like wild salmon and turned into tacos seasoned with an ancho glaze. 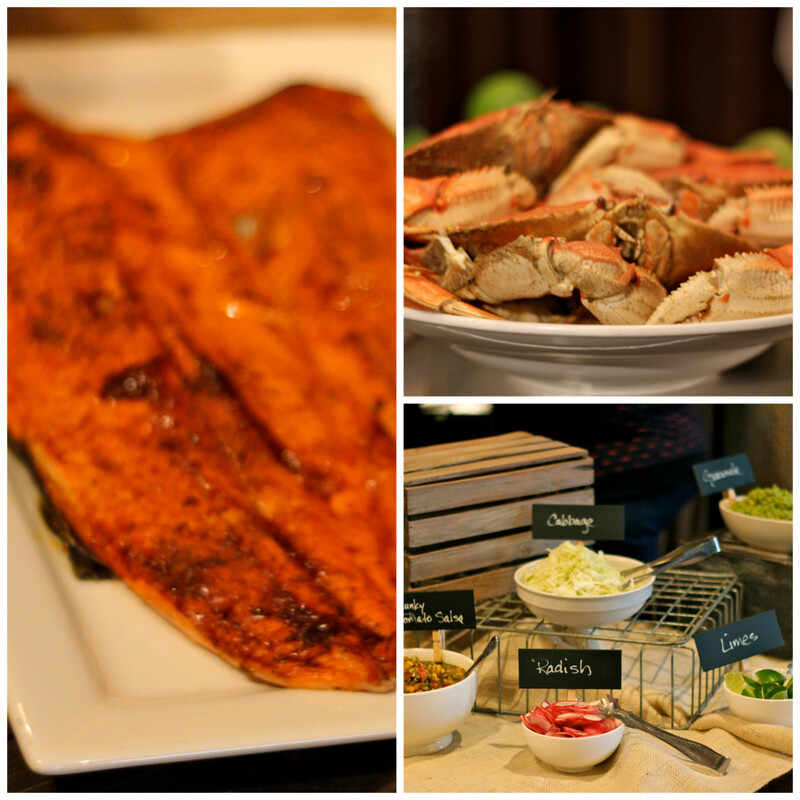 I was in awe of the creativity of Dungeness Crab used as a spicy salsa inside a black bean soap or on top of your guacamole. My taste buds were dancing all day long with this unique flavor combination. One of the great things about attending chef challenges is all the interesting facts you discover, such as how they use food and why they prepare the dishes that they do. Chefs tend to be more relaxed when they are with others like them. 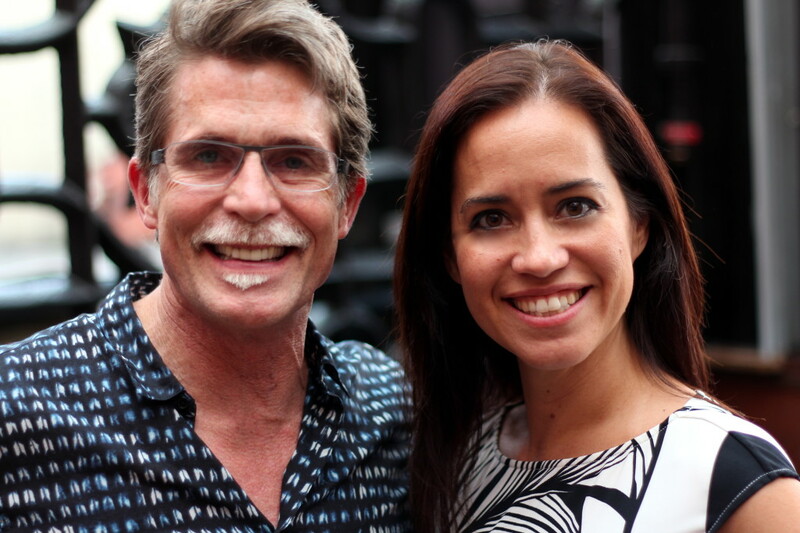 I learned a couple of new things about Rick Bayless at this event. He started visiting Mexico when he was 14, loved the place and returned annually throughout his school years. Later, he began cooking with locals to learn traditional Mexican techniques and flavors. He returns to Mexico at least once a year, studying different regions each trip. I also learned about Seattle’s own famous Chef Tom Douglas. He owns 16 restaurants in Seattle, yes 16! He makes a point to go into every restaurant a week and taste that they are all up to his standard. 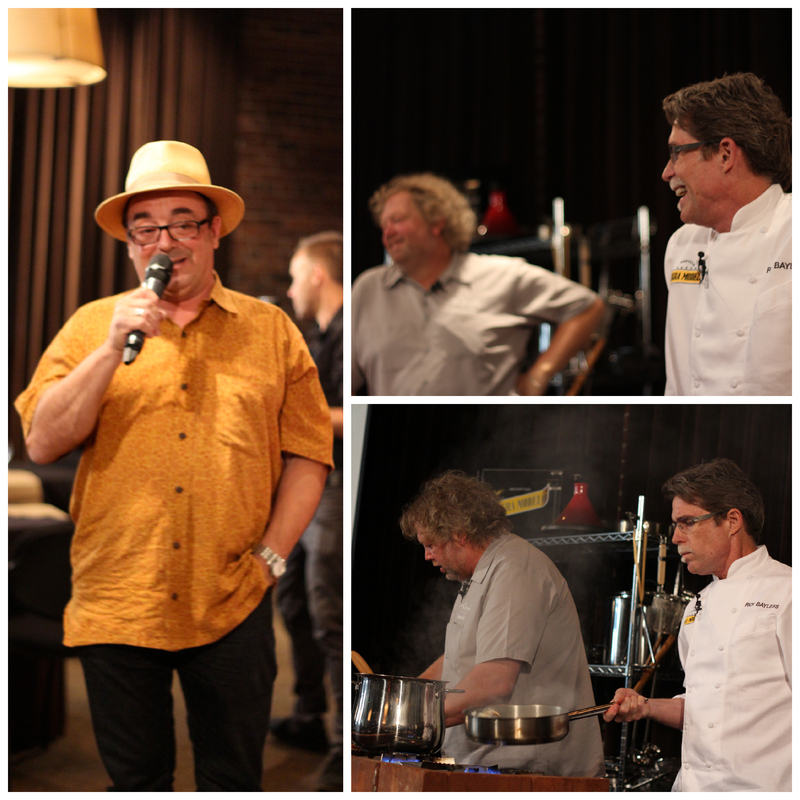 The constant banter between Tom Douglas and his friend Thierry Rautureau (the Chef in the Hat), who emceed, made this enjoyable event even more fun. The chefs approach each situation with their own unique perspective. Each of the chefs made a signature dish for us and Thomas Douglas’ team provided several other menu items for our lunch. Rick Bayless approached his recipe with his typical use of authentic Mexican techniques to build a dish with flavors both enhanced by the Negra Modelo included in the recipe. He created Smoky Pulled Pork Tacos with Roasted Tomatoes and Negra Modelo. Bayless Tip: when roasting tomatoes, do it on top of foil, so you do not ruin your pans. If you want a smokier flavor in your sauce, keep the char on the tomatoes. 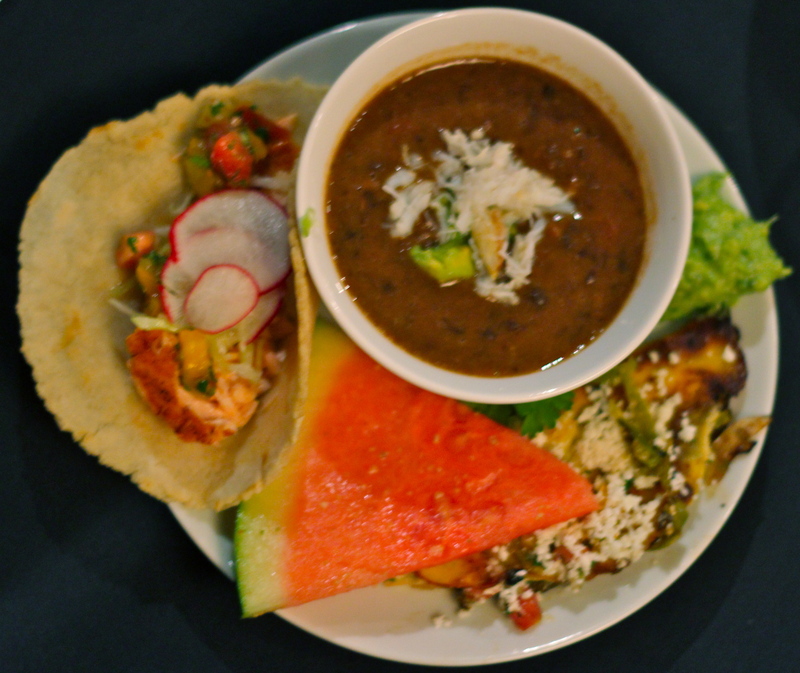 Tom Douglas added a Northwest twist to a Black Bean and Ham-hock Soup presented with Dungeness Crab with Avocado-Tomatilla Salsa. Douglas tip: Your kitchen should have a hand blender. It makes it easy when preparing soups and sauces in your kitchen, and they are inexpensive. Both were delicious, as were all the other dishes we ate during the presentation. The outcome? The audience won! The day continued into the evening where I attended my first LIVE #FoodieChats with Chef Rick Bayless and the #FoodieChats Founder Steve Green and other bloggers and food lovers. I was quite impressed with Rick Bayless’ involvement in the chat. He was actively tweeting and he thoroughly enjoyed all the pictures and tweets coming in to him. It was refreshing to see that he see the power of twitter. 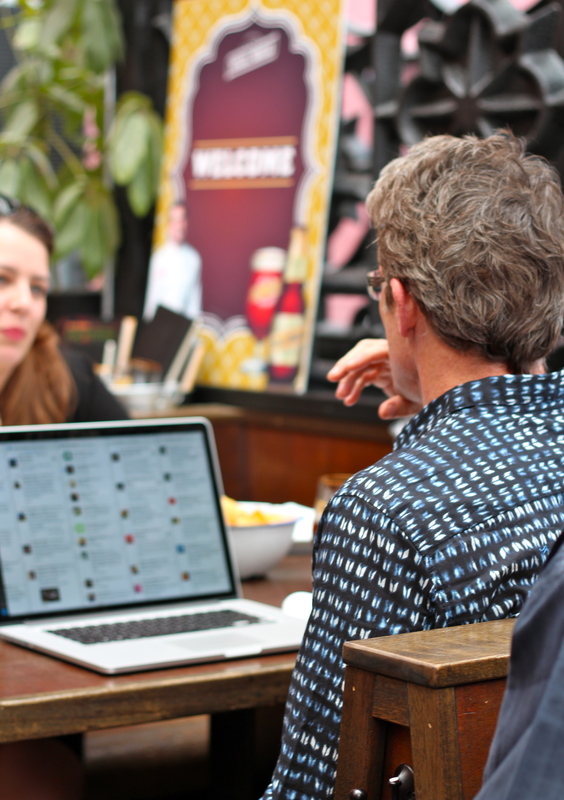 If you have never join a #FoodieChats, you should do it…like this next Monday. It is hard to describe all the amazing and diverse people who join, BUT I always have a takeaway – a recipe, a tip or a new friend. 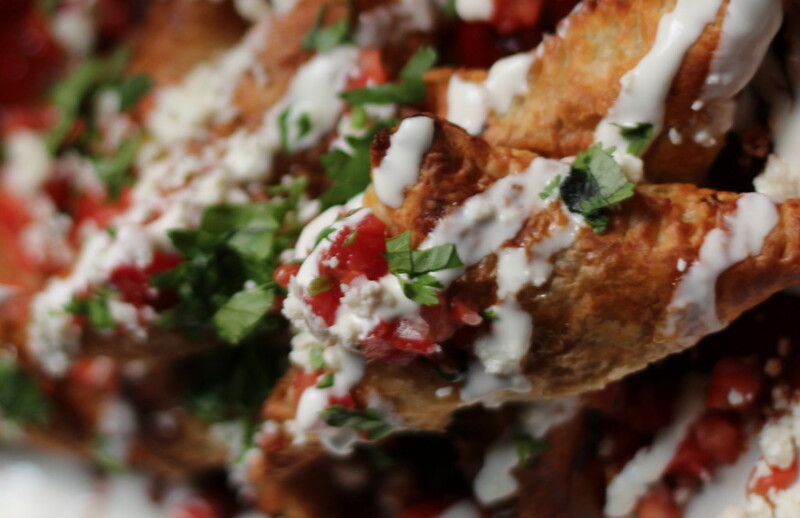 What would a LIVE #FoodieChats be without food?! As the #FoodieChats sponsor, Negra Modelo ordered some AMAZING dishes to add to the experience at one of the best Mexican restaurants in Seattle, Poquitos. 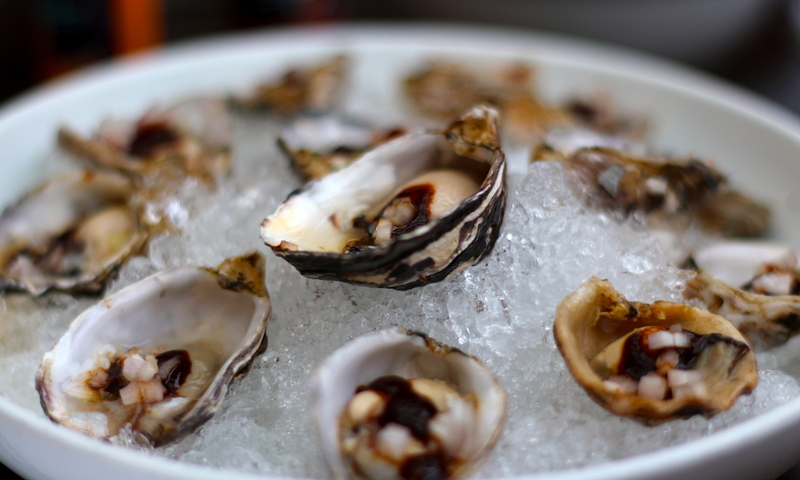 We enjoyed Kusshi Oysters (pictured above) with salsa negra, shallots and lime; Scallop Tiradito (pictured below) with fresh jicama, cucumber, green apple, shallot, chile, lime and cilantro; Dungeness Crab Guacamole with chipotle, onion, lime and cilantro; and, Local Albacore Tostadas with Albacore ceviche, tortilla crisp, avocado, lemon, shallot, chile, garlic chips and cilantro. Because we didn’t eat enough this day ;), we celebrated a successful #FoodieChats at another amazing Mexican restaurant called Barrio at Capitol Hill. I highly recommend the empanadas (pictured below) and Cazuela de Camarones when you go there. Yes, you really need to put this restaurant on your list as it has a great vibe and delicious food for the Northwest. Suffice it to say, I fasted the next day, BUT oh the great memories I made on this dreamy day! 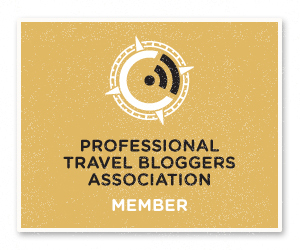 After spending the day with Mr. Bayless, or Rick, since we’ve met ;), here’s my takeaway. He is very kind, even though I’m sure he tires of people like me enamored over him. He is just like what you see him on TV, approachable and knowledgeable. I also love how much he shares his passion of cooking and Mexico with his daughter, so much that she is a part of Mexico: One Plate at a Time and written a cookbook with her father! But, there’s more! He’s also been married to his wife Deann forever, and they work together! Disclosure: Negra Modelo provided me with airfare and lodging in Seattle. All opinions are mine and may not reflect those of the company. I am disclosing this in accordance with the Federal Trade Commission’s 16 CFR, Part 255: “Guides Concerning the Use of Endorsements and Testimonials in Advertising.” All photos are mine and subject to copyright. It was also great to meet Toni from Food Just Sayin’ and Samantha from The Little Ferraro Kitchen in real life after exchanging recipes and tips online over the years. By the way, be sure to join me this next Monday for #Foodiechats from 7PM – 8:30PM CST, as I am a co-host! 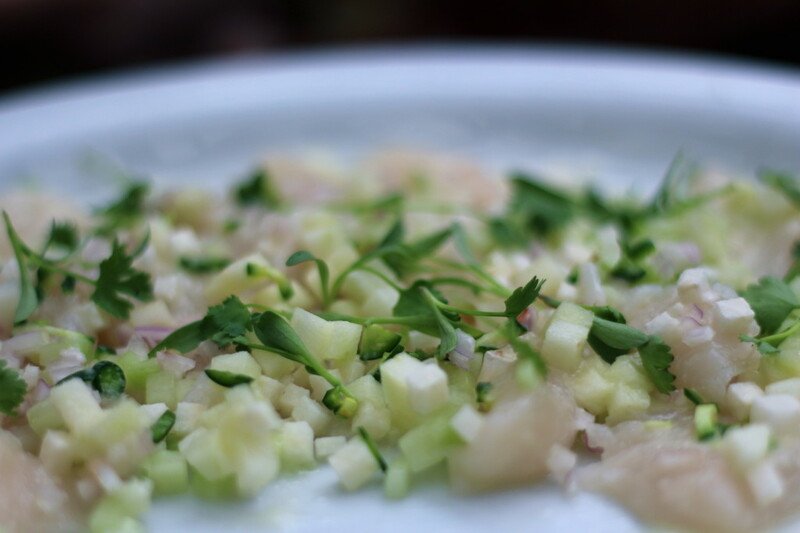 Follow @Foodiechats on Twitter. I guarantee you learn something, meet interesting people and want to eat better. I hope to tweet you there! I’m such a fan of Rick Bayless. I have several cookbooks by him and was introduced in my home 10 years ago too when we were childless and living a more exotic life in travel and in food! So glad you had this opportunity. I’m giddy for you!